Oh…it’s Thursday again and time for another Create with Connie and Mary Thursday Challenge and this week we have a GREAT sketch for you! Since I used the Four Feather set for my card set for Create with Connie and Mary Holiday Card “Create”tions, I had this really awesome Washi Tape large feather left over from one of the cards I made and couldn’t let it go to waste so I used it on this! Whisper White – 2 1/2 x 1, cut into a banner, stamp greeting using Lost Lagoon and add to card front. 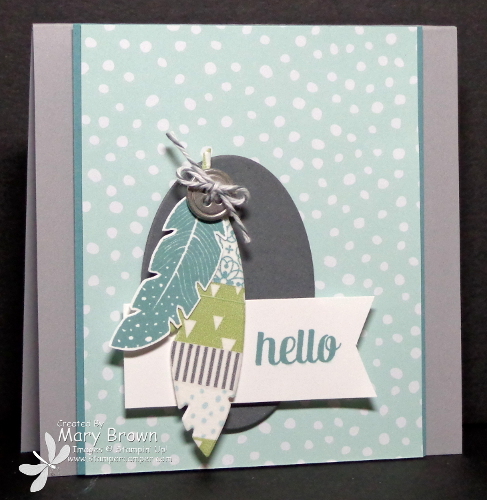 Small leaf – stamp using Lost Lagoon on Whisper White, cut out and add to card front. 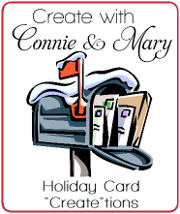 We are half way through the first week of the Create with Connie and Mary Collection! This time we are doing an ALL CARD collection…how cool is that??? You don’t want to miss it! It’s not too late to subscribe and you can get 3 weeks of all cards (1 week Halloween/Fall and 2 weeks Christmas) for only $19.95! AWESOME!!! So head over to Create with Connie and Mary to learn more and subscribe today! This entry was posted in Create with Connie and Mary, Holiday Mini and tagged For All Things, Four Feathers. Bookmark the permalink. Love the feathers! And I love how you used the washi tape! Very clever!! So glad you hung on to that beautiful feather and created this lovely card with it! I LOVE the feather set and this is yet another great card you’ve made with it! That is such a creative way to combine the washi tape with the feather framelit and both feathers look beautiful against the designer paper you chose! Great inspiration for your card – leftovers! I have so many of those I must put to good use! GORGEOUS!! I really need to get these feathers!! The colors are beautiful and the the washi tape is a clever touch!